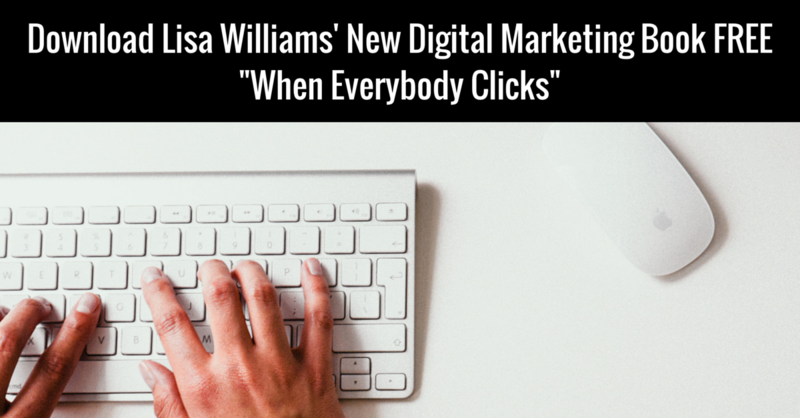 Between conferences and clients, Lisa Williams — a woman who needs no introduction in the SEO community — has been hard at work on her first book, “When Everybody Clicks: Sustainable Digital Marketing,” will be available on June 2. In fact, “When Everybody Clicks” will be available for free download if you sign up between June 2–5. For your free copy, enter your email here and she’ll send you your free ebook Friday! In writing this book, Williams interviewed more than 60 digital marketing thought leaders, including Bruce Clay, Eric Enge, and Ian Lurie. The aim of this passion project? To understand how relationships impact the technology industry. We turned the tables on Williams and asked her to answer our questions in this exclusive interview. Williams, who is speaking at SMX Advanced next week, reveals lesson learned while writing “When Everybody Clicks” and talks about digital marketing priorities and Google’s mobile-friendly update. Kristi Kellogg: As you interviewed the industry’s best and brightest, how was your own digital marketing interviews impacted? 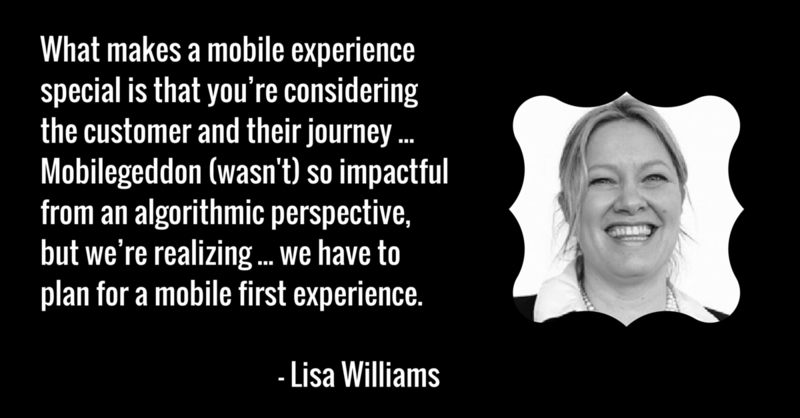 Lisa Williams: The most powerful lessons for me were around discovery and client partnership and engagement. For instance when you take on a new client it’s important to first spend time in discovery and make sure that they’re a good fit for you and that a strong partnership is a possibility. Ian Lurie from Portent Interactive shared that the biggest issues for establishing the client relationship is that brands often want consultants to behave as tacticians. Conversely, agencies need to better understand the business problem the brand is trying to solve rather than pushing their specific services. Bill Hunt founder of Back Azimuth shared the importance of spending time getting to know a potential client. For example he shared that he asks the sponsor of the project how they handle failure. What he’s looking for is a pattern in partnership. Do they get angry and quit taking phone calls or do they look at failure as an opportunity to learn? How we choose our clients is just as important as the work that we execute for our clients. That focus and investment in partnership goes both ways. LW: To be honest every step has been a challenge for me. Finding the right people to interview was a challenge. I didn’t really know anyone when I started writing the book a few years ago and my friend and mentor Anne Kennedy paved the way for me to interview the right people by setting up an interview with Bill Hunt. He turned out to be one of my favorite interviewees. I learned so much in my first interview with him that I was certain that I was on the right path. The next challenge was understanding how to create a process and focus around the interviews. Taking my learnings and putting them into a workable format was a challenge. Finally getting the book published has been a challenge … If I had to do it again I’d join something like Jim Kukral’s Author Marketing Club rather than learn most of the hard lessons on my own. The one final challenge for me was accepting that the goal for my book, besides educating myself, is curating and driving this conversation around how important it is for us to commit to the relationships that are a part of the digital marketing ecosystem. KK: Your resume and projects list reads like an encyclopedia. What are your top three productivity tips? LW: That’s just what happens when you been practicing for 19 years ;) My top three productivity tips come from books and smart people I learn from. The first one is having a”Checklist Manifesto.” It focuses on making sure that the things that really need to happen every single time (whether that’s in the emergency room or on a construction project) that you document that process with checklists. The second tip is making sure to set your goals at the beginning of the year regarding what’s important to you and laying out measurable, actionable, relevant and time bound strategies and tactics to achieve those goals. For example one goal is to write 100 articles this year, so I broke down that goal into writing 1,000 words a week. The third tip came from Chris Brogan, he shares that whatever strategies and tactics you create to achieve your goals should be seen as a system so the focus becomes about the journey not the destination. KK: At SMX, you’re speaking on the panel “Converting the Mobile Visitor.” Well, you can’t think of mobile without think of Google’s mobile-friendly update. Did you or your clients see an impact? What’s your take on Mobilegeddon? LW: We didn’t see an impact. Basically this is a way for us to dot the i’s and cross the t’s on making sure that our customers can consume our content regardless of the device that they’re on. Those are table stakes, it’s not anything special. What makes a mobile experience special is that you’re considering the customer and their journey. I thought it was telling that after Mobilegeddon about five percent of sites are doing a better job of being mobile-friendly. It wasn’t that Mobilegeddon was so impactful from an algorithmic perspective, but we’re realizing (especially now that there are more mobile searches than desktop searches) we have to plan for a mobile first experience. KK: In February, Google made it easier for advertisers to engage smartphone users with call-only ads. Have you been running call-only ads? Any tips? LW: Google’s Surojit Chatterjee presented at Hero Conference in Portland a couple weeks ago and he did a great job of showing how very impactful calling is from mobile. There has been an 11X increase in Google searches that include the phrase “near me.” That clearly illustrates how important local and the call is in the searching process. KK: Let’s say you just got $10,000 to finance a digital marketing campaign for a national industrial kitchen equipment manufacturer — where and how would you invest it? LW: As companies struggle to make a connection between their content strategy and content marketing and how that impacts the final conversion, we are seeing a lot of value in influencer identification and outreach. For example there’s a company called Movable Media that provides not just the content that a brand needs, but more importantly the audience that comes with that content. Quite surprisingly it’s not necessarily the influencers with the most Twitter followers or the most LinkedIn connections but it’s the writer and expert who’s most closely aligned with the audience in the community. Connecting around a topic, tribe leaders have the most power when it comes to moving an audience. If a clear communications strategy was in place, I would spend the $10k on an influencer identification and outreach program with the goal of connecting with the community and tribe. LinkDex has some amazing tools for this strategy. KK: What about for a yoga clothing retailer? LW: Again I think it’s less about the e-commerce or shopping experience and more about engaging the community so my focus would be around better understanding why people care about yoga. I love the saying that we don’t shop for a drill we shop for the hole. We’re looking for the result. Yoga isn’t just about the exercise it’s about the lifestyle around putting your calm, your peace, your quality of life and care of your body as a priority. There are convincing statistics that show particularly millennials don’t want to be advertised to they want to participate in a community. KK: With 19 years in the industry, you probably have a good sense of current and future digital marketing trends. What’s the next big thing in digital marketing that you’re anticipating? LW: Remember back in 2010 when we kept saying it was the year of mobile and now it finally is this year of mobile? I’m looking forward to digital marketing integration. What I mean by integration is that we’re not just asked digital marketers to execute a campaign on Twitter or execute an SEO campaign or execute a content strategy. I’m looking forward to brands allowing us to work with the other smart people on their teams to create a strategy for and execute against a holistic integrated marketing initiative. This highlights why partnership between brand and agency is so imperative. KK: If you could have coffee with anyone in the world, who would it be? LW: That’s a great question, I think it would be Sheryl Sandberg. I never realized until I read her book how important it is to our ability to lead to have a strong network and community that supports that end. The movement she started has truly been groundbreaking. I heard a talk on NPR the other day that shared that in the early ’80s there was a huge drop off of women in technology and computers. They traced the trend back to advertising and marketing. Basically computers were being marketed to boys and men and not to women. Once women got in the classroom they didn’t have the hands-on experience that men had and the numbers of women in the industry fell off a cliff. Sandberg has created a call to action for women to be stronger leaders and have the will and confidence to lead. She’s also asked that the men in our lives help further the cause of helping women ask for and get what they want and deserve. I’ve just kicked off my own Lean In circle here in Portland, Oregon and it is powerful thing to connect with women from different industries, at different ages and places in their careers and realize how many challenges we have in common. For example, I’ve learned that confidence isn’t a feeling — it’s a result of action. That’s a powerful distinction. It’s lessons like these that are going to help me and other women to be stronger, better more confident leaders. Thank you so much Lisa! Can’t wait to read your book and see you at SMX Advanced!